NATO foreign ministers gather for the session to formally admit Montenegro at NATO Headquarters in Brussels Wednesday, Dec. 2, 2015. Russia has reacted strongly to NATO opening formal talks with Montenegro to joining the alliance. Moscow warned that it would be obliged to respond if the Balkan state joins NATO. Why is the Kremlin so opposed to a tiny Adriatic country joining the military alliance? Russian politicians and analysts have reacted strongly to NATO's North Atlantic Council initiating talks with Montenegro on December 2, on its accession to the military alliance. Moscow has consistently held a position on NATO’s expansion to include Montenegro for some years, with Foreign Minister Sergei Lavrov saying in 2011 that NATO membership would not add to the security of either the region or the alliance as a whole. In 2014, Lavrov described the possible accession of Montenegro to NATO as "irresponsible and provocative." Russia’s State Duma issued an appeal to the Montenegrin parliament in mid-November, as well as to the governments of NATO and OSCE member countries. The text pointed out that "the bloc approach to guaranteeing security," "involving states, especially against the will of their people, in military alliances, are political tools from the Cold War era." Montenegro has conducted an aggressive campaign to join NATO over the past two years, with emphasis on a confrontation with Russia. According to opinion polls released by Montenegro’s Prime Minister Djukanovic in June 2015, 47 percent of Montenegrins would vote for accession to NATO and 43 percent against, with about 65 percent of respondents convinced that the state will become a member of the alliance in the near future. 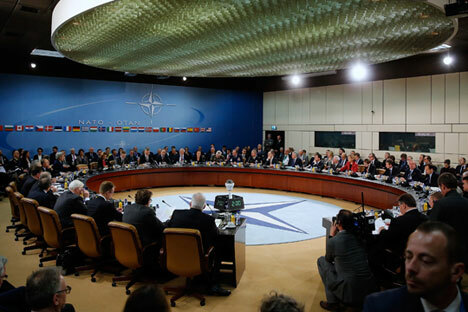 However, according to research carried out by the Damar sociology agency in June 2015, 41.6 percent of Montenegrins would vote for joining NATO, while 39.7 percent are against it, with over 15 percent undecided. Meanwhile, the Montenegrin opposition has accused the authorities of manipulation and refer to an internal government document in which 57 percent of citizens are opposed to joining NATO vs. 35 percent in support. Around 84 percent of the population favour a referendum on the issue. “How could it be that for a half year the number of NATO opponents has declined by an unbelievable 17.3 percent? What could have such a strong influence on citizens’ minds?” read the official communique of the opposition Movement for Neutrality [Pokret za neutralnost] of Montenegro. At the same time, the Montenegrin authorities have accused Russia of fomenting mass anti-NATO demonstrations in the Montenegrin capital Podgorica in recent months. Russia denies the accusations. As Alexei Pushkov, chairman of the Duma’s international committee, said in an exclusive interview with RIR, "Djukanovic cannot force his citizens to love NATO, and dumps the blame for this on Russia." Distrust in the Montenegrin government's reports within the country and beyond is supported by numerous corruption scandals, for which Djukanovic has become notorious. His name has consistently crept up in the media in relation to contraband flows in the Mediterranean region and trafficking in organs of Kosovo Serbs, while fresh accusations include a claim by Russian senator Frants Klintsevich that Djukanovic's regime is trading arms with the Islamic State (ISIS) radical jihadist organization. Despite the fact that many countries of the former Warsaw Pact and three former Soviet republics have joined NATO since the fall of the USSR, the potential accession of Montenegro has caused a particularly emotional reaction from the Russian side. This is because Russia and Montenegro are united by 300 years of close cooperation, with Russia contributing to the establishment and development of Montenegrin statehood in the 19th century and being among the first to recognize the country’s independence from Serbia in 2006. Investment from Russian business has served as a strong driver for Montenegro’s economic development since then. Viktor Kolbanovsky, director of the Russian Balkan Centre for International Cooperation, said Russia's special attitude to the issue is because the "brotherly" Montenegro somewhat "politically betrayed" Russia by joining the EU's sanctions against Moscow in 2014, and by now taking one more step toward the final breakup of traditional relations with Russia. Speaking on Dec. 2, just as the news broke, the president's press secretary Dmitry Peskov warned that Russia would respond if Montenegro were to join the alliance. "On various levels, Moscow has always noted that the continued eastward expansion of NATO and NATO's military infrastructure cannot but result in retaliatory actions from the east, i.e. from the Russian side, in terms of ensuring security and supporting the parity of interests,” said Peskov. State Duma Deputy Speaker Sergei Zheleznyak was more specific, telling RIR that "we have to appropriately limit our contacts in the economic and other spheres." Nikita Bondarev, head of the Balkan sector of the Russian Institute for Strategic Studies, believes, however, that such measures may be counterproductive, since they primarily hurt ordinary Montenegrins and Russian expatriates and immigrants living in the country (5,000-10,000 Russians are believed to be permanently resident in Montenegro, with around 70,000 owning second homes there). According to Bondarev, "Russia first of all can and should put all its diplomatic and political weight behind seeking a nationwide referendum on Montenegro's accession to NATO." Zheleznyak also spoke about the need for a referendum on this issue. "We fully support those action teams that are trying to insist on holding the referendum," he said. However, there is also a different opinion on the further development of events. Maxim Samorukov of the Carnegie Moscow Center believes that strategically the Balkans "have lost their attraction" for Russia due to the fact that large energy projects such as the South Stream gas pipeline have become irrelevant, so "serious practical actions by Russia in the Balkans" in response to Montenegro’s accession to NATO are "unlikely to follow."